The Bender Bunch: Top Pinterest Picks Party! 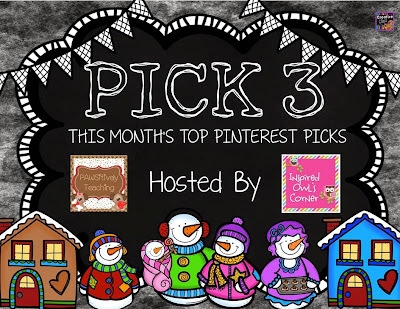 I'm excited to share a few winter pins today with "Inspired Owl's Corner" and "Pawsitively Teaching" for their Pinterest linky party!! Here are three of my top faves, two that we will be doing in my class next week! My students LOVE FROZEN, they love Science, and since it never snows in the desert they are sure to be super excited about this one! This will be messy, but fun! With only 9 students and two aides...I think we can pull it off! You can click on each picture to be taken to the direct pinterest link. Be sure to check me out on Pinterest for more ideas! And if you're not visiting me from "Inspired Owl's Ways" or "Pawsitively Teaching" be sure to visit their blogs for more inspiring pins on the 3rd of every month! That erupting snow looks like so much fun! I'd like to do it for just me. Love the wand! Haven't seen that one before! You blog design is so cute and I LOVE the erupting snow! Thank you for sharing. I love the wishing wands! I love the erupting snow! My class would just love it! Maybe one day for inside recess we can make it. Thanks for sharing and linking up! Valentine Bloghop!!! 28 Days, 28 Bloggers!!! February In A Click! Let Me Plan Your Month! Huge Upcoming Hop & LOTS of Science!